The use of electrical discharge machining is so essential that it is almost impossible to imagine a modern shop without an EDM machine. Many of today’s products simply could not be produced without it. Think of all the cell phones, calculators, IPods, cameras, medical devices and the endless amounts of high tech equipment that are made out of plastic! Besides the essential role it plays in plastic injection mold making, EDM is used for the precision machining of medical parts, aerospace parts, and other highly specialized products. Electrical discharge machining, including Wire EDM, has also completely changed the way molds are made, as well as other specialized parts. Check out the pages dealing with graphite, graphite dust, copper, dielectric fluid, electrode holders, and machinery. What about jobs in EDM? Find out what kind of personality it takes to have electrical discharge machining as a career job. See what the future holds in this high-tech profession. You can also find educational material that attempts to explain this rather mysterious process. Not so long ago, it was as much black art as science. Today, however, much of the mystery is removed due to CNC controls. Most shops send their operators to classes put on by the manufacturer of their EDM machine. It is foolish to invest so much money in a machine and skimp on the training! But it happens all the time. What about EDM and stress? EDM is quite a stressful occupation, to put it mildly. It may not appear difficult, but the stress levels can be exhausting. Nearly every mold component that is EDM’d is in the final stages of manufacturing. The slightest mistake can become very costly, very quickly. 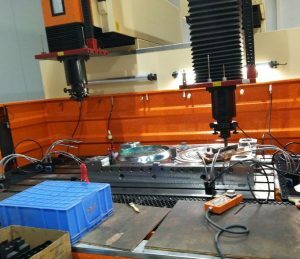 There is nothing quite like the feeling of coming to work in the morning and seeing your supervisor leaning over the EDM machine staring at your workpiece. Then you find out that you had mixed up two locations and the completely finished cavity block is now completely useless! The process of injection molding process is best explained as heating up a type of plastic and under a forced type or pressure is poured into a predesigned mold, after the hot liquid is poured into the mold the mold is clamped shut to prevent any air from getting in. After the initial work is done, the mold hardens and takes the shape of the mold. Then the next step in the process is when the resin (hard plastic) which is now in the shape of a small pellets are poured into the feed hopper, the hopper is a large open bottomed contained and what it does is that is filters the pellets into the screw. As the screws turn the resin pellets are moved into the screw and then they go through a very intense pressure. Then friction is created and when that happens heat is generated to melt the pellets. There are heaters on both sides of the screws and there is temperature control during the melting process. The oil gets pumped from the tank to the injection molded parts that run along the tie bar equipment, then that’s when the liquid plastic gets injected into the mold. Then the water-cooling technique is applied in assist in cooling off the mold. The process is complete when the mold is pulled from the pre-designed mold. There are constantly new techniques and new technology in the industrial world of injection molding. New machines, new plastics, new equipment. There are some companies that keep up with other companies by buying a lot of expensive equipment the second it comes out. But these are the companies that cost so much because they have to charge more to pay for the price of the new equipment they just bought. But then you have the companies that like to keep using used machinery because they are just as good as new and as the old saying goes if it isn’t broke don’t fix it. Not every company wants to be the fancy company with all new machines. Some companies want to just be known as the company that did my job in the most outstanding way. They want the recognition for a job well done rather than for the company who spend a lot of money on a piece of new machinery. Companies that keep using used machinery don’t have to increase their prices and customers like to see that and they will keep coming back to the company that does great work for a great price. In the industry of injection molding, things work on a very specific scale. The molds must be right, the specifications must be right. That is true for the molds that are already designed. When a company wants and needs brand new design molds the process must be handled very delicately. When an plastic molding company gets contracted by a new company to design and fill molds. The company needing the molds must be very accurate and very specific when it comes down to doing a custom job. One slight imperfection and the whole project could be worthless. Time is money and that is not something that either can afford to be wasted. The injection molding process is a specific one, there are certain stages and certain things that have to be done and if your design has a flaw in it then there are going to be set backs. When a mold comes out after it hardens, it looks great a little rough around the edges, but it looks what it is supposed to. 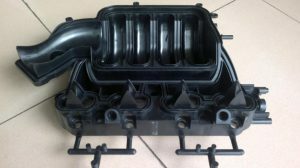 Molding produces great products and there is a science to the skill in making the molds and producing the injection molds. If you are a company who is looking for a custom design, make sure the specs and designs are not flawed and you will get an unbelievable product. In this post I’m going to explain how injection molding works. Creating polymers is an amazing process. Then there is the question of forming the plastic or rubber into useful objects….another fantastic discipline. One of the most common methods of forming rubber or plastic resins is a process called injection molding. Injection molding is made possible by large machines called injection molding machines. Material, either rubber or plastic resin is fed to the machine. This can be in the form of a hopper for plastic pellets or an auger for thicker, heavier compounds. Colorants are usually fed to the machine directly after the hopper. The resins enter the injection barrel by gravity though the feed throat. Upon introduction into the barrel, the resin is heated to the appropriate temperature to make it melt. This now viscous material is injected into the mold by a reciprocating screw or a ram injector. A reciprocating screw provides the advantage of being able to inject a smaller percentage of the total shot1. The ram injector on the other hand, must typically inject at least 20% of the total shot. A screw injector can inject as little as 5% of the total shot. Many factors also come into play such as the type of mold, how the material is injected, etc., effect the shot. 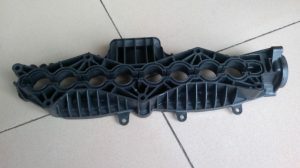 The Plastic mold is a cavity in the machine that receives the material and shapes it accordingly. In order to make the injected material solidify, the mold is cooled constantly to a temperature which makes the solidification possible. The mold plates are forced together, usually by hydraulic force. The clamping force is defined as the injection pressure multiplied by the total cavity projected area. Molds are typically over-designed with regard to the pressures they must endure depending on the material to be cast. In addition, each injectionable material has a calculated shrinkage value associated with that has to be accounted for as well. Burned or Scorched Parts: Melt temperature may be too high. Polymer may be becoming trapped and degrading in the injection nozzle. Cycle time may be too long allowing the resin to overheat. Warpage of Parts: Uneven surface temperature of the molds. Non-uniform wall thickness of mold design. Surface Imperfections: Melt temperature may be too high causing resin decomposition and gas evolution (bubbles). Excessive moisture in the resin. Low pressure causing incomplete filling of mold. Incomplete Cavity Filling: Injection stroke may be too small for mold (ie. not enough resin is being injected). Injection speed may be too slow causing freezing before mold is filled. Plastics are used as molted liquid to form the main ingredient in injection molding; the plastics that are used are polymerization, which basically means molecules that have had a chemical reaction and the properties change as a result. Plastics were first on the rise after World War I including new types of plastics called PVC and PS. PS or polystyrene is a brittle but tough type of cheap plastic that is used to make airplane and car model kits and other little toys like that. They are used in plastic molding because the plastic can break down easily. PVC has a great and respected reputation as a strong and sturdy plastic; you can do many things with it because of the strength of the material. PVC is used on fencing, pipes and pipe covering. PVC is molded and used in injection molding because when it solidifies it becomes a durable solid materials. One of the best materials used in molding is nylon. Nylon is also called polyamide. This is the strongest and most flexible material you will ever find. Dupont began manufacturing nylon based products in 1939 and have a great and powerful fiber ever since. Injection molding is only as good as it’s materials. When you are looking for a company to do a terrific job handling your custom injection molding contract. You want to make sure that they can cover your needs. If at all possible, tour the facility of where you are interested in having your work done. But you want to make sure their facility can handle the load. You want a company that handles both a large and small volume of work. Some companies only will do a certain amount of work therefore they turn down small amount jobs. You want them to provide samples, you want to be able to see what kind of job they will do for you before you contract a huge order and do not like the work. You want full production abilities, process optimization, and Insert molding and over molding, PPac capabilities. You also want packaging and domestic and international shipping capabilities. The company that you contract for your work, you want to handle the type of job you have for the price that you want. That is why it is important to tour the facility to see first hand how the company will handle your job load. You want a guarantee that the job you give them will be nothing less than spectacular. This is what contract Plastic molding is all about. One type of injection molding machine is the Milacron LIM, Liquid Injection Molding; there are many benefits in having this machine over the traditional LIM. This machine has its own controls and especially made soft ware for this product only. It has a low pressure set up for injection setup and it has a closed loop control. Unlike the traditional LIM this machine has an increased power ejector force, so it can inject the mold quicker. It has a standard injection screw, a cooling plate on both sides, eight new pneumatic valves, and two heat zones on each paten, a 3-stage air ejector. The improvements from the standard LIM also include a revised rear seal on the injector screw and also a revised seal that is on the nozzle. These machines have a thermo set process that uses a silicone rubber material that is used to be injected into the heat plastic molds. The best part about these Milacron machines is that no other machine can use their software is designed just for their machines and no one else’s. The Milacron also has a complete design line of Fluid Auto meter mixers. Milacron is one of the best in the business of injection molding and if your company needs to replace a machine, consider this one, it is one of the best. These are some of the top companies in the United States in the injection molding field. If you are looking for a great company with great reputations, check out these companies. MOCAP, Inc, located in St. Louis, MO. They are a full service company; they are a manufacturer of standard and custom injection molding designs. They use all grades of plastic and they do a lot of volume and can handle as little or as much volume as needed. Precision Tool & Die located in Derry, New Hampshire. They are an all purpose company, they provide custom manufacturing, service and a general manufacturer. They provide on site molding with perfect injection molds, they also do insert molds, transfer molds and they also do complete designs. World Class Plastics located in Russell Point, Ohio, this company is also a custom manufacturer, a service and a manufacture company. Their company profile says they are QS9000 registered, they do custom thermoplastic injections, and they fabricate molds and tool design. The G&F Industries located in Sturbridge, MA, they are a service and manufacture company. They are listed as an ISO 9000 certified company; they have a great reputation in the fabrication of injection Plastic Molding and plastic fabrications that use the injection molding process. They also use a robotic system and a real time production team. Do you know any other injection molding companies that deserve to be mentioned here? Injection Molding: this is a technique used to fabricate parts made from thermoplastic materials. Thermoplastic materials: are materials made out of plastic that are able to melt into a liquid when heated at a high enough heat and when it freezes it will be in a glassy state when it is cooled. Polystyrene is a polymer that is a liquid hydrocarbon that is commercially made from petroleum. Polypropylene is a very hard plastic that is used for many different uses such as food packaging, reusable containers and textiles. It is a very durable and rugged unusually. Resin is comes from many plants especially from the Coniferous tree that is used for its chemicals. You can use resin for adhesives and incense and some perfumes. Solidify is to become hard or firm. Pellet is a small compressed piece of material or a substance. Nylon is a chemically resistant, it is also heat resistant, but it is tough and very flexible.